Christmas truly is the best time of year. No other season has so many wonderful meanings and traditions. Growing up, our family had its share of traditions, many of which we would like to continue with our spouse and family. As part of a couple, sharing Christmas traditions together (and making up new ones) makes the holiday season even more special! 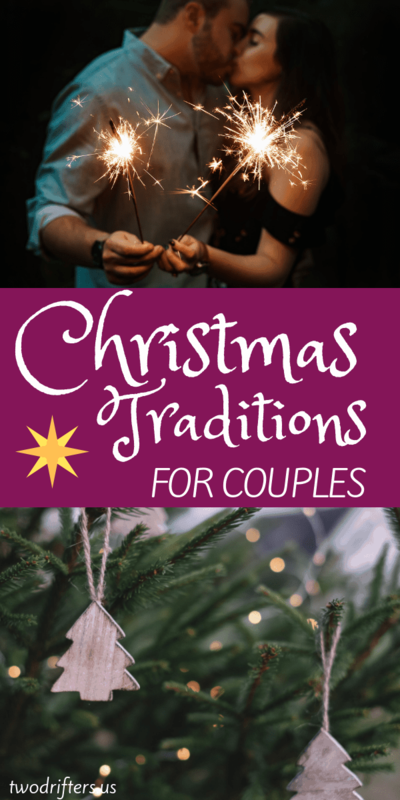 Here are some Christmas traditions for couples you can try together, making this year (and future years) extra meaningful and memorable. An Advent Wreath can be a special way to welcome the season of Christmas. In the Christian calendar, Advent is the first season of the church year, leading up to and including the four preceding Sundays before Christmas. Advent is a time of expectant waiting for the birth of Jesus, symbolized by the lighting of one candle on the Advent wreath each week. The Advent wreath is a horizontal evergreen wreath which symbolizes the four weeks of Advent with 4 purple candles, with a white candle in the center, which is lit when Christmas has arrived. During the Christmas season, there are ample opportunities to create or continue traditions together. Some ideas include sharing Christmas chores and decorating together. Everything is more fun when it is shared, especially tasks like writing Christmas lists, shopping, putting up lights and writing Christmas cards. Make an evening (or several) of baking Christmas cookies and watching Christmas movies together. Make a gingerbread house or gingerbread train or village! Singing carols in the car while you drive around to see the lights is a tradition we have created in our own family. Finding and bringing home a Christmas tree is a Christmas tradition couples and families can enjoy. You don’t have to drive into the woods and chop a tree down with an axe (although that is one way to do it, especially in New England) but simply choosing the perfect tree from the Christmas tree lot is also a great deal of fun. A fun tradition for many couples is to spend time cooking together. To make it even more special, bring family recipes to share or create new ones together. A special meal or dessert that grandma used to make can bring the generations closer. You can also make cookies, fudge, or the dreaded fruitcake! to share with neighbors and friends, or invite some relatives over for a wine or cake tasting holiday party. 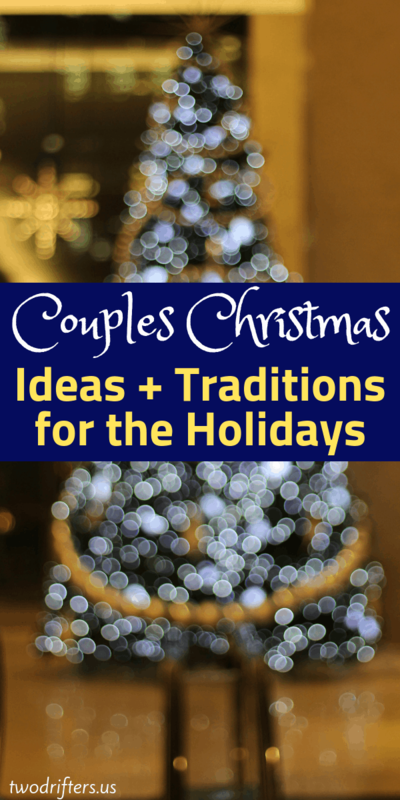 For couples, a Christmasy and romantic idea is to create at least one date night together during the holiday season. Buy tickets for a show, have a great dinner out, go ice skating or sledding, anything fun that you both enjoy together. If your budget allows it, make the date last a night or two with a quick getaway. Perfection: spend a romantic weekend in a snowy bed and breakfast inn! Trimming the tree together, whether the day after Thanksgiving or on Christmas Eve, can be a special tradition between partners. When I was growing up, my parents had a tradition of trimming the Christmas tree on Christmas Eve, after the children had been tucked into bed with visions of sugarplums. My parents would quietly string the lights (accompanied by glasses of wine I am guessing!) and place the ornaments, filling the stockings with care and assisting Santa with the presents. When we woke on Christmas morning, we were stunned to see a beautiful, sparkling tree with presents underneath. Another Christmas tradition in our family was hanging Christmas stockings on the mantle. The stockings started from left to right according to the age of the family member. It is fun for couples to hang (and fill!) Christmas stockings for each other, filling them with special tiny treats, making Christmas morning fun and special! Going to church on Christmas Eve is another wonderful Christmas tradition for many couples and families. Many churches have a midnight candlelight service. You may already have a church you attend together, and if not, Christmas Eve would be a perfect time to find a church together that you both like. While many choose to wait ’til Christmas morning to open all their gifts, it can be a nice Christmas Eve tradition for couples to exchange a gift on Christmas Eve. 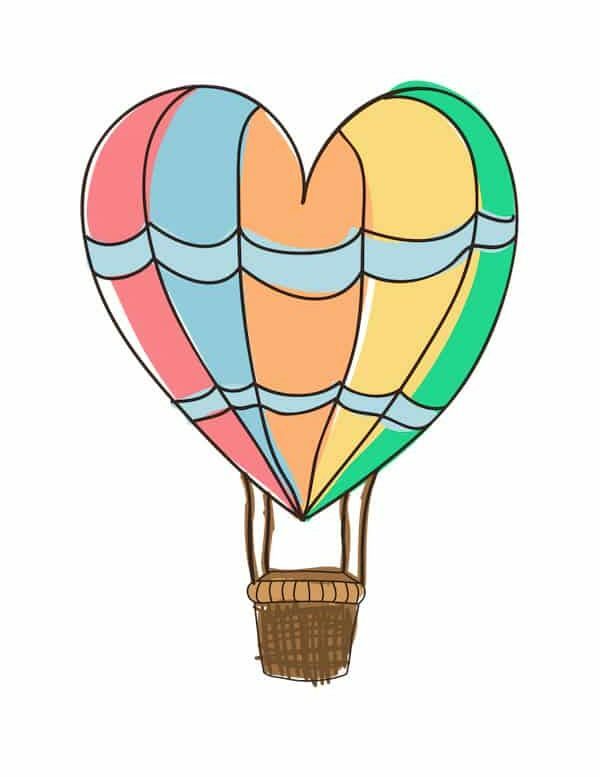 Particularly for couples with children, this can be a nice opportunity to quietly give your partner a gift while the kids are securely tucked away in bed. You could even wait until midnight to add that extra little bit of Christmas magic and romance. Giving back during the holiday season can become a meaningful Christmas tradition that a couple can share together. Choose a charity of your mutual choice, and commit some time to helping others in need. Giving of your time is a wonderful way to serve others during the holidays. Volunteer at a soup kitchen or a homeless shelter or assist at a charity event. Why not dress up as Santa and Mrs. Claus and visit a children’s hospital? If you’re short on time, you can still do something worthwhile. Fill a shoebox for children, donate money to a favorite charity, or write Christmas cards to send those serving in the armed forces. You can also do something more personal for a family in your area. Maybe a busy single parent could use a babysitter for an evening? No matter what you choose to do, spending this worthwhile time together is sure to create special holiday memories, as well as begin a new tradition together. Want to change up some traditions? Couples all bring their own childhood traditions, but it’s also fun to create new ones. Did you grow up having a special Christmas dinner? For a change, try making a great Christmas breakfast together. Make all the days leading up to Christmas special by singing or playing Christmas music together while cooking or driving in the car. Leave gifts under the tree to increase the anticipation and fun. In the hustle and bustle of the holiday season, shopping and parties, find some time to be alone together to relax, share a special meal, and maybe some champagne or hot chocolate? Snuggle in front of the fire, read a good book, watch holiday movies together…the possibilities for creating your own traditions are endless. Whatever ways you celebrate, be sure to savor the season! It flies by before you know it! And don’t forget to spend some time making New Year’s resolutions together! What your favorite Christmas tradition?